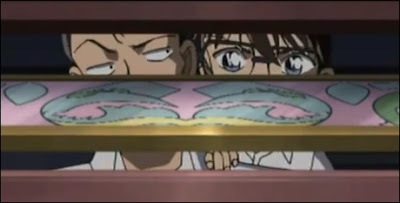 Last month, I reviewed a one-hour TV-special from the Detective Conan anime series, entitled The Cursed Mask Laughs Coldly, which first aired on March 13, 2000 in Japan and the episode has a splendid plot with a terrifying, brand new locked room trick – a grisly paragon of originality. I was alerted to the existence of this TV-special by Ho-Ling Wong and since then he has brought another, three-part episode to my attention. A three-parter with a pair of equally original impossible crimes. The Case of the Séance's Double Locked Room originally aired in January and February of 2010, covering episodes 603-605, which were written by the same screenwriter as The Cursed Masks Laughs Coldly, Ochi Hirohito. You can clearly see his style of plotting and ideas reflected in the locked room tricks from both of these (multiple) episodes. Just like in my previous Detective Conan post, I'll be using the English names given to some of the characters in the U.S. editions of the original manga series, re-titled Case Closed, because I already reviewed volumes 38-65. So a reversal back to the Japanese names might be confusing, but feel free to cool your purist rage in the comment-section below. This three-part episode opens on a dark, misty road in a wooded area and Richard Moore, Rachel and Conan are, as the latter accurately predicted, completely lost, but a lonely mansion with a lighted window is spotted in the distance and they decide to seek shelter there – only to get a startling surprise when the door is opened. A cabal of cloaked figures answer the door, cowls drawn over the heads, but one of them recognizes the famous "Sleeping" Moore. Koji Yatsukawa is an assistant director working for Nichiuri TV and apparently made his first appearance as a TV original character in the two-part episode The Seven Wonders of the Hiroshima Miyajima Tour, which actually sounds like a potentially interesting detective story. Something along the lines of Yasuo Uchida's Togakushi densetsu satsujin jiken (The Togakushi Legend Murders, 1994), but hopefully with a better ending. Anyway, the group introduce themselves as a fanclub of the late Miyahara Kira, a cosplay idol and actress, who was supposed to star in the movie adaptation of The Blackmagic Girl. A popular occult manga created by the owner of the mansion, Reiki Hirasaka, but Kira drove her car over the edge of a cliff and her body was never recovered – resulting in the movie getting canned. However, she's not at rest. Rumors are swirling around claiming Kira, like the protagonist from The Blackmagic Girl, has risen from the dead and became a witch in order to extract revenge on those who have betrayed her in life. Several weeks ago, Hirasaka's production editor was fatally wounded in a knife attack and he left a dying message in his own blood that read "Kira." So the fanclub decided to gather at the home of Hirasaka, who's well versed in the occult, to conduct a séance in his Meditation Room and summon the ghost of Kira, but the séance turns out to be sham performance and the two detective who happened to presence, Moore and Conan, immediately uncover a whole host of gadgets that were responsible for the apparently supernatural manifestations when they made contact with the spirits – like exploding candles, voices coming from framed posters, shaking lamps and plates tumbling out of cupboards. I think readers who love a good debunking of a séance in their detective fiction will particularly like this scene. Thackeray Phin gave an expose in John Sladek's marvelous Black Aura (1974) of some of the most well-known tricks spiritual mediums used in the old days and, if I remember correctly, he only overlooked the cheese cloth smeared with luminous paint, but this episode added a couple of new tricks to repertoire. And some of these tricks double as clue for the locked room murder later that night. During the night, they all receive a text message from one of their fellow club members, Shoko Utakura, which says "I have come back to life" and is signed with "Kira," but Utakura is nowhere to be found and search leads them to the door of the Meditation Room – which has, somehow, been padlocked from the inside. Moore has to break a window in the door, in order to smash off the padlock, and when they enter the room they discover that all of the posters have been taken out of their picture frames and the frames are in disarray on the floor. 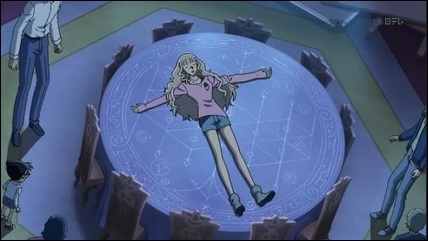 The body of Utakura lies on top of the séance table, arms sprawled out at her sides, but the only problem is that the only other exist is a closed window high up the wall. So how did the murderer left a perfectly sealed room? This is, however, not the only impossible murder committed that night: Hirasaka is locked inside his room and is unresponsive, which prompted one of the people to take a peek inside the room through the open transom above the door. A transom that only opened for about ten centimeters and through it you could see Hirasaka body lying on a coach with a toppled bottle of wine on the table. Obviously, he had taken a swig of poisoned wine, but this problem gets even more baffling when Moore breaks open the door. The decorative posters that were taken from the Meditation Room were torn to pieces and piled inside this second locked room, but even more inexplicable is that the key to this room and that of the padlock were found in a drawer of Hirasaka's desk – which also had been securely locked. Finally, the rope that was used in the first murder lay next to the heap of shredded posters! Ho-Ling was, to use his own words, "a bit disappointed" by this second locked room trick and appeared to him "unambitious for someone who created a masterpiece" like The Cursed Mask Laughs Coldly. I admit that the central idea behind this impossibility is derivative of the locked room trick from The Cursed Mask Laughs Coldly, but it's used here in an entirely different and far more practical manner, which I found to be almost as satisfying as the gruesome trick from that previous episode. One thing I have come to appreciate, after nearly tagging 400 blog-posts with the "Locked Room Mystery" label, is innovation and originality. However, I completely agree with Ho-Ling that this second impossibility is (further) strengthened when you see it in the light of the locked room trick in the Meditation Room, which definitely ticks the boxes for being innovative and original – as well as wonderfully clued. A great advantage of telling a traditionally plotted detective story in the medium of comic books or animation is that you can blatantly show what is going on without the danger of giving anything away. As the viewer, you can probably gauge the escape route of the murderer from the Meditation Room, but how this person managed to do that is another story and one you won't have a shot at answering if you don't connect it with what happened in that other room. And that's where this episode becomes somewhat of classic locked room story. 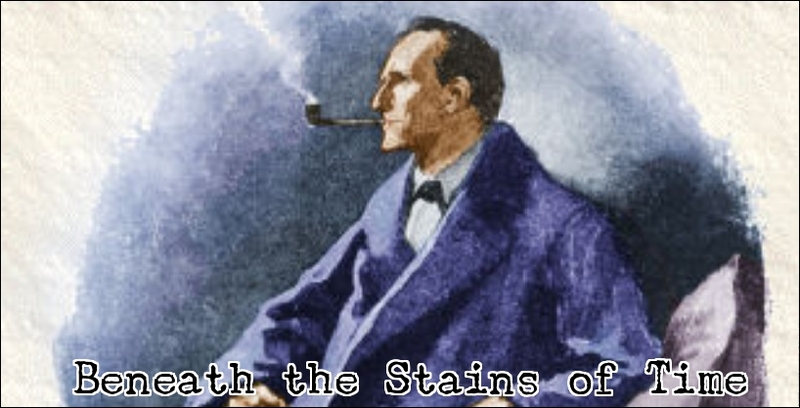 John Dickson Carr described the perfect detective story as being a ladder of clues or a pattern of evidence, "joined together with such cunning that even the experienced reader may be deceived," which is perfectly exemplified in the plot and solution The Case of the Séance's Double Locked Room – which has a sound and logical reason for everything that happened during the night of the murders. Everything is linked together by logic and reason. The murderer even has a good motive for making the murders look impossible. Carter Dickson's Sir Henry Merrivale lectured in The White Priory Murders (1934) and The Peacock Feather Murders (1937) on all of the possible motives a murderer could have for going through the trouble of creating a sealed room illusion, but I don't think this one was mentioned. And that's another aspect making this a more than noteworthy impossible crime tale. So, as a locked room mystery, this one is almost as great as The Cursed Mask Laughs Coldly, but this three-parter also shares the same weakness as that one-hour special: the who-and why behind the murders are very obvious. However, you shouldn't watch these episodes for the who or why behind the murders, but how the murders were perpetrated and why the murderer went through all that trouble to present the crimes as complete and utter impossibilities. I really think my fellow locked room enthusiast should start looking at these detective anime and manga series, because they have some truly excellent and original miracle crimes. And, as visual (animated) mediums, they can do more with the form than the written word or even a live-action TV-series or movie. The locked room tricks The Cursed Mask Laughs Coldly and The Case of the Séance's Double Locked Room are good examples of this. I can't recommend them enough! Good to see you liked the episodes too. The way the second room is not only a logical and necessary result of the first locked room AND the motive, but how it also helps strengthen the mystery of the first locked room is really fantastic, and it's this synergy you really seldom see in any mystery fiction, even from the Giants. Speaking about mystery manga, the (Japanese) book Honkaku Mystery Manga Seminar was delivered today, giving a historical and critical account of mystery manga from the very first titles until now. I've skimmed through the pages a bit today, but it certainly looks like this will be THE standard work on this topic for the coming years. You're right. You don't often see (locked room) murders this tightly entwined in a detective story. Carr's The Hollow Man comes to mind and those early, double-murder plots in Christopher Bush's work, but they're not very common. Particularly ones that are as good as this three-parter. Will you be reviewing the manga book? Sounds really interesting. And, on a (semi) related note, you'll probably find my next two scheduled blog-posts of interest, because I stuck to Japan for those posts. Will probably be reviewing it, though don't expect a review very soon. Hi TomCat.Just wanted to let you know that there is a brilliant case in detective academy Q focusing on the seance theme.It wasnt a locked room murder but the crime was impossible to commit for anyone.Seemed as if a spirit was responsible.But Kyu Solves it brilliantly.It has been animated too wonderfully.Personally,Of all seance themed murder cases,I rate this one as the best,even better than the conan case.Do you agree or not? I've seen the Detective Academy Q episode, years ago, but from what I remember, it was not as good as this one. 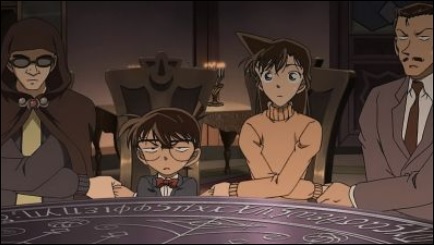 It was a good, solid episode and excellent example of the impossible murder during a seance, but this one from Conan blows it clean out of the water. I think on the whole,the story in detective academy Q & shock factor at the end puts it miles ahead of the conan case.Conan case was brilliant in trick,but nothing else was. 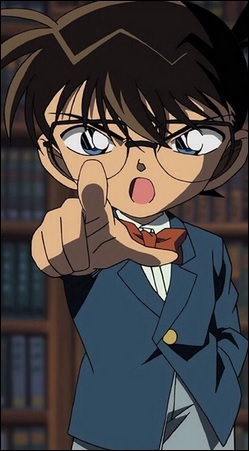 I would have to re-watch the episode, because I watched it all the way back in 2007 or 2008, but I would be seriously surprised if it was better than this case from Conan.